I've been on the washer making band-wagon for almost a month now and thought it was high time I shared the love.. So, who's up for a Give-Away??? I rather like all of them but if forced to choose then it would be the two with the circles. I usually use knitted cloths on the smaller size and not in chunky cotton. Though I do have a few in chunky knitted with your (super quick and easy pattern). When I have a few minuets I think I'll give the tapestry tutorial a try. Thanks for the giveaway and good luck everyone. I love the dots Jodie...I had never used the cloths until this year. My mum gave me one and I was an instant convert. Much better than a yucky sponge in the kitchen. I'm loving them...I love how you put the little button on tho hang it. I love the paper dolls and the chevron! I've never used hand made washers before but I have knitted cotton dish cloths which I love. It's so nice to have them hanging over my sink, rather than the standard ones you can buy at the supermarket (and they last much longer too). Hi Jodie, been reading your blog for ages but I don't think I have ever commented. 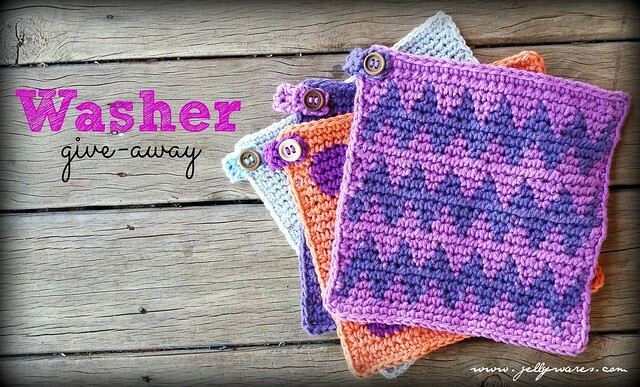 I use cotton waffle dishcloths and I love that I can just chuck them in the wash and use again and again. I have never use or made a crochet one, but this year I have been slowly slowly learning and I reckon it would be a great way to learn new stitches. I really like the light blue and the bright orange. Hi Jodi. I love them all and would be happy with any of them. I do like the orange polka dot and the the purple and pink polka dot ones the best. Thank you for offering the giveaway. Not sure if you were including your followers from the states. I know mailing them here would be costly. I just sent the book from my giveaway to Australia and it was rather pricey. I love using washers and I really like the crocheted and knitted ones. The top two are my favorite, but I do like all of them. I found you via OneCraftyMumma and I love your tutorial - although I think it might take me a while to try it out. I would love anyone of these so I can examine it closely while trying to create something as gorgeous as these for friends. I especially love the purple ones - although the one in pink would disappear into my little girls room faster than you can say WOW! Last week I was not going to get into crochet....but Mel at one crafty mumma is inspiring me once again....and YOU! 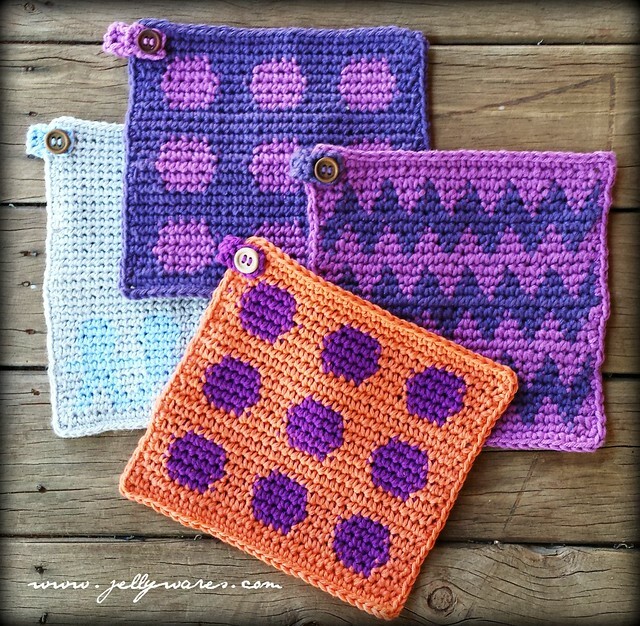 I adore the orange and purple polka dot cloth and the chevron is just so "On trend"! I would love to win these and to experience crochet washers first hand and then perhaps begin some myself....an great project to pack whilst camping at Christmas time I'm thinking! Wow, these are pretty! And I just use plain old white ones. Fabulous! I've never used handmade ones! I like the blue and purple ones! I have never used a handmade cloth, but I am thinking I sure would like to. Love the pink and purple colour schemes.